The development and building of a continuous Chicago River Trail is an initiative that both candidates in the 33rd Ward aldermanic runoff election support. Deb Mell and Rossana Rodriguez-Sanchez are the candidates in the 33rd Ward, which is on Chicago’s North Side and includes parts of Ravenswood Manor, Avondale, Albany Park and Irving Park. The seat is currently held by Ald. Deb. Mell. Connecting the 312 RiverRun Trail that will end at Belmont Avenue (pictured) to the trail at Lathrop Homes, which runs north and south of Diversey Avenue. Creating a safe route between Gompers Park and River Park. 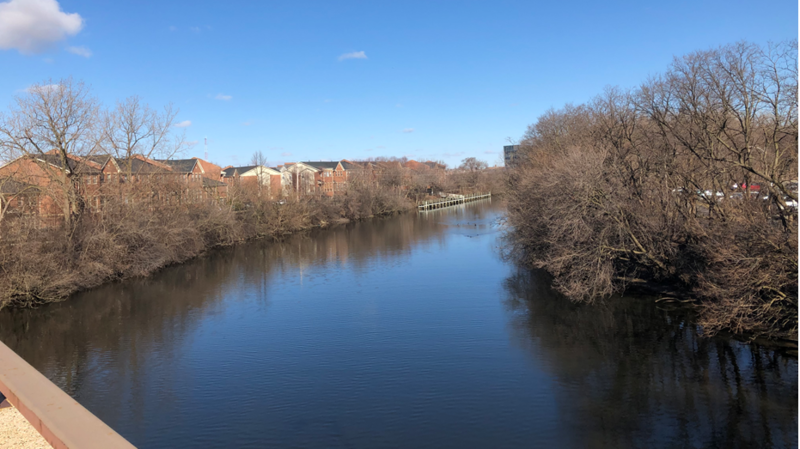 Such a connection — which would run through the 33rd and 39th Wards — would link two of the busiest regional trails, the North Branch Trail at Foster Avenue to the North Channel Trail. We’re pleased the 312 RiverRun Trail is on track to be completed in 2020 and the trail at Lathrop Homes later this year. At the same time, our campaign is determined to advance solutions to address the trail gap that will exist between Belmont and Diversey Avenues. Active Trans staff and local partners met with Deb Mell, 33rd Ward Alderman who’s running in the Feb. 2 election. She’s pictured fourth from right. 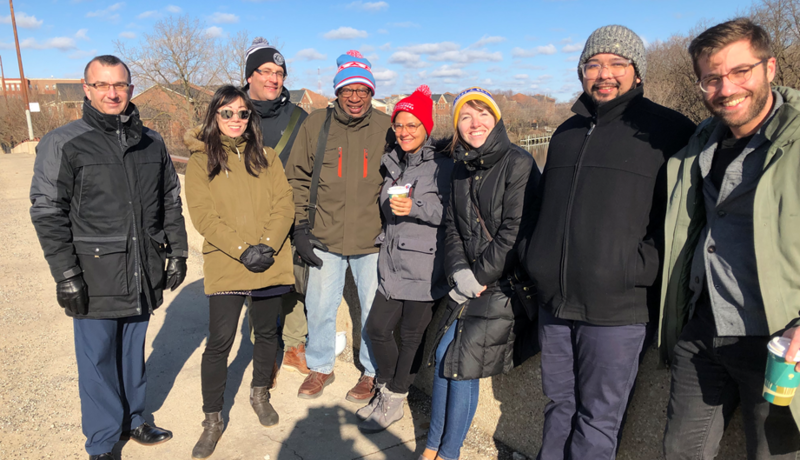 In order to keep the momentum going, Active Trans received a grant to facilitate a community-led project that will develop concepts for connecting the 312 RiverRun Trail to the trail at Lathrop Homes. Both Mell and Rodriguez-Sanchez support connecting these trails and they support the overall vision for a 27-mile continuous Chicago River Trail. Ald. Mell pledged her “continued” support for a river trail as a member of the Chicago River Trail Coalition. 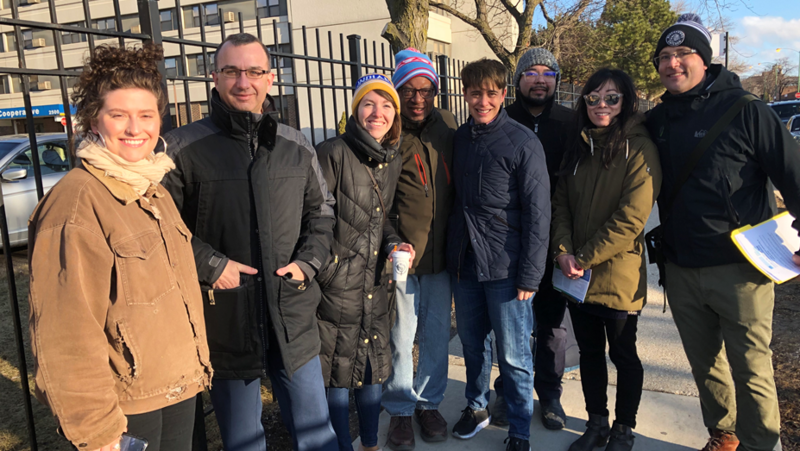 Active Trans staff and local partners met with 25th Ward Aldermanic candidate, Rossana Rodriguez-Sanchez, pictured fourth from right. Active Trans provided both candidates with a set of written recommendations for completing the most pressing river trail projects. After the April 2 runoff, Active Trans and our partners will engage aldermen in riverfront wards, asking them to sign on to a letter calling on the new mayor to develop a comprehensive plan for a continuous Chicago River Trail. To receive updates and opportunities to get involved, please join the Chicago River Trail campaign.